This free event features excerpts from the spirited productions of Gaîté Parisienne, Les Biches, La Boutique Fantasque, Le Train Bleu, and ending with Marc Wilde’s showstopping Bolero. Join us for an evening of high kicks and humor! You are invited to a live performance and multimedia presentation introducing the Ronn Guidi Foundation for Dance. 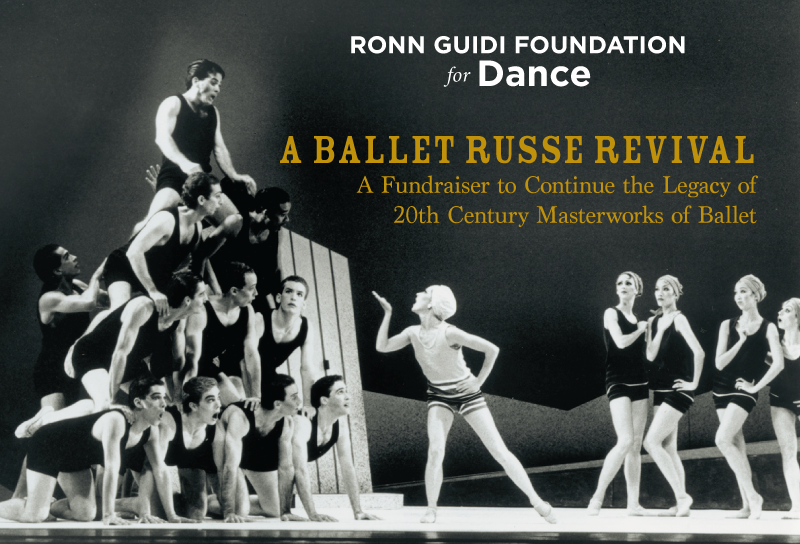 The Foundation’s goals are to raise funds to support performances of early 20th century ballet masterworks rarely seen today. 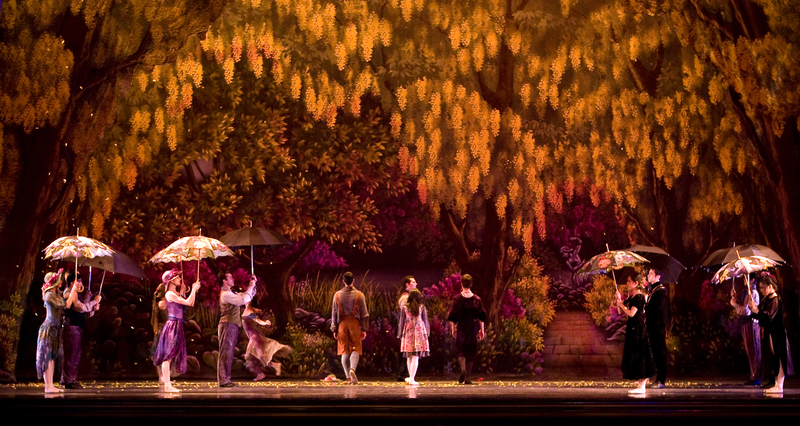 Through choreographic, costume, and set revival, the Foundation hopes to bring back legendary works like Michel Fokine’s Scheherazade; Bronislava Nijinska’s Le Train Bleu and Bolero; Eugene Loring’s Billy the Kid and Time Unto Time; and Antony Tudor’s Lilac Garden and Echoing of Trumpets, among others. In his many years as Founding Artistic Director of the Oakland Ballet Company, Ronn Guidi was able to bring back to the stage eleven Ballet Russe era works of art that were lost or rarely performed. It is a goal of the Ronn Guidi Foundation for Dance to raise funds for dance companies that would perform these masterpieces. The financial support would also provide help in staging these works. Ronn Guidi will talk about his work with the Oakland Ballet, working with such giants as Bronislava and Kira Nijinska and Massine to meticulously recreate the great Diaghilev ballets. Admission is $10 for the general public. Free for OLLI members and UC Berkeley faculty, students and staff. Ronn Guidi founded the Oakland Ballet Company and served as its Artistic Director for 35 years. He is recognized and acclaimed for the world class repertoire he created for the Oakland Ballet both locally and internationally. Oakland Ballet toured with his varied and extensive repertory throughout the U.S., Canada, Mexico and Europe. Through his vision, many of the masterpieces of the Diaghilev Ballet Russe era (1909-1929) have been reconstructed as living art for audiences of our time and been staged by many other dance companies throughout the world. Margaret Jenkins is a choreographer and artistic director of the Margaret Jenkins Dance Company, as well as a designer of unique community-based dance projects like Choreographers in Mentorship Exchange (CHIME). In the 1960s, Jenkins studied at Juilliard, continued her training at UCLA and returned to New York to dance with Gus Solomons, Jr., Jack Moore, Judy Dunn, Twyla Tharp, and Viola Farber. Until 1976 she taught for and was an assistant to Merce Cunningham. Since her return to San Francisco, where she has worked now for over four decades, the MJDC has been a part of the cultural fabric of San Francisco, dedicated to the making and touring of new work, and international exchange in Japan, India, China and Israel. She has been a guest lecturer at UC Berkeley and has made work for many other companies including the San Francisco Ballet for their 75th anniversary season. She has received numerous commissions and awards including a Guggenheim Fellowship, the Bernard Osher Cultural Award and a residency in Bellagio, Italy at the Rockefeller Foundation.